Just bought a betta today from petco. I added him to my year old 20L cherry shrimp tank. Rainbo, OrchidxBetta, KFischer and 1 others like this. 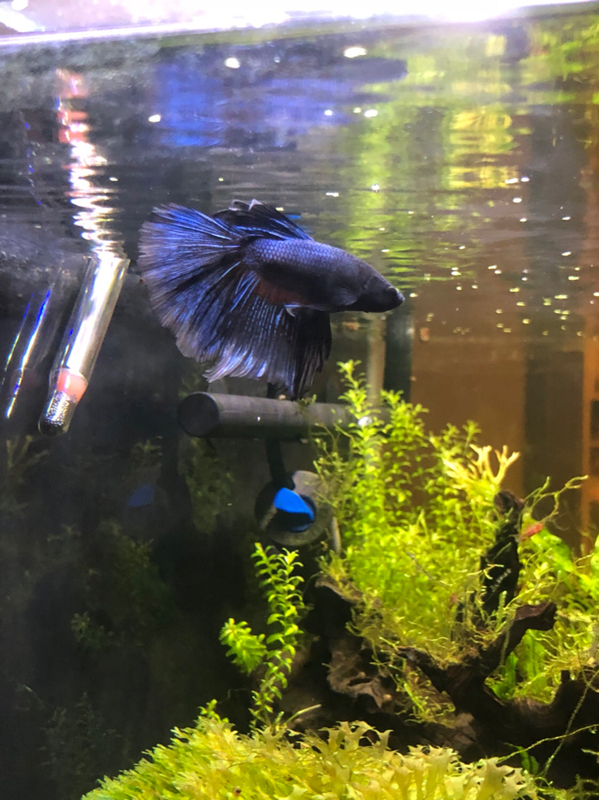 You have a beautiful tank and a great looking betta! He's lucky to have ended up in Betta paradise. Hopefully he has a chill attitude and doesn’t turn into a shrimp serial killer lol. I’m also worried about the flow in the tank, hopefully it’s not too strong. I've found that so long as they can get out of the flow it's not a problem and with a 20L he should get out of it. None of mine have been bothered by the filter in my larger tanks. Well except for Bruiser who decided to full on attack the filter when he was first put in his tank. He's since learned to leave it alone or play in the outflow. LOL, yep some betta can be hard on the tankmates, hopefully yours won't. Bruiser only lives with snails. No way would I put him in with fish or shrimp, he's too territorial! Beautiful tank and betta. 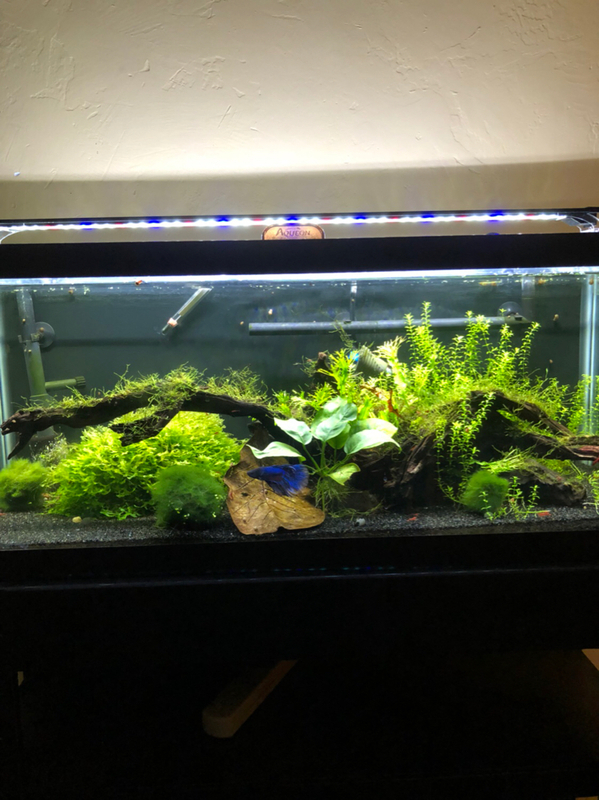 Wish I can figure out how to beat algae - would love to set up a "real" planted tank. I often "over kill" with pumps. I bought them for high current fish, but often use them for bettas. For example using a 50g+ pump in a 13g. As long as there are areas where current is blocked, your new buddy will be fine. However, late feeding often induces mine to hunt down shrimps. Once they've tasted fresh meat, they'll always go after my shrimps. And regardless how much hiding places I provide the shrimps, my bettas eventually catches them. Yeah I have a canister filter rated for 55g on a 20g tank. I’ve never had algae problems but I’ve only kept cherry shrimp and rams horn snails in the tank. I don’t feed the shrimp very much either. If he starts killing too many shrimp I guess I’ll have to get his own tank. Wow he's gorgeous! And your plants look awesome! I hope my plants will look that good.